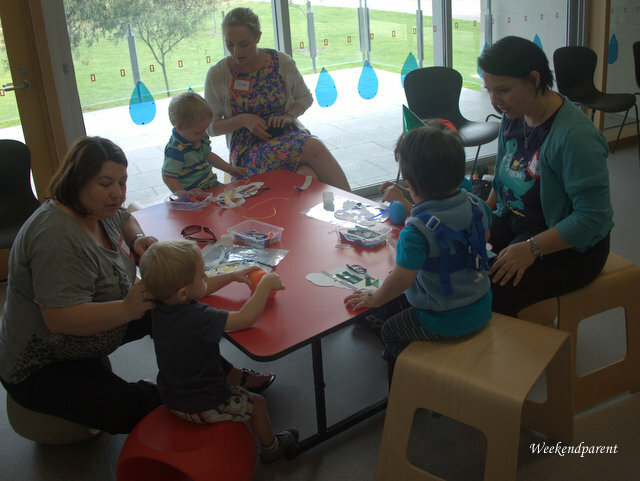 Where to take a group of 2, 3 and 5-year-old boys and their parents on a family trip to Canberra? An art gallery might not be the obvious choice. 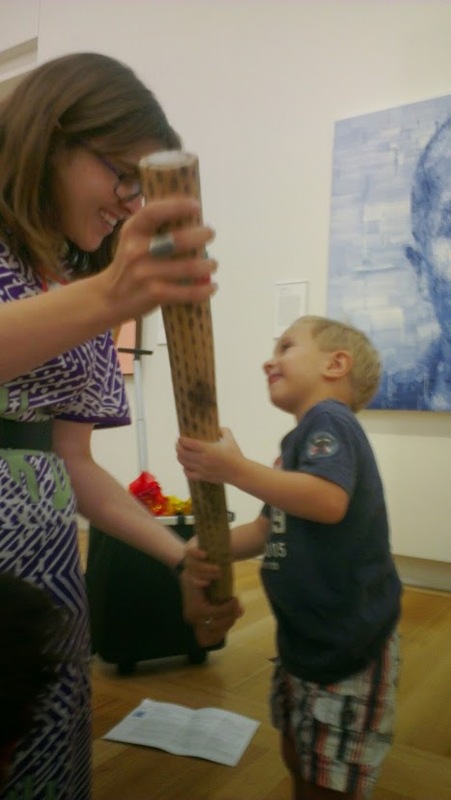 But we were inspired and entertained during our family friendly visit to the National Portrait Gallery, Gallery, as part of a special 101 Local Human before-the-gallery-opens experience. 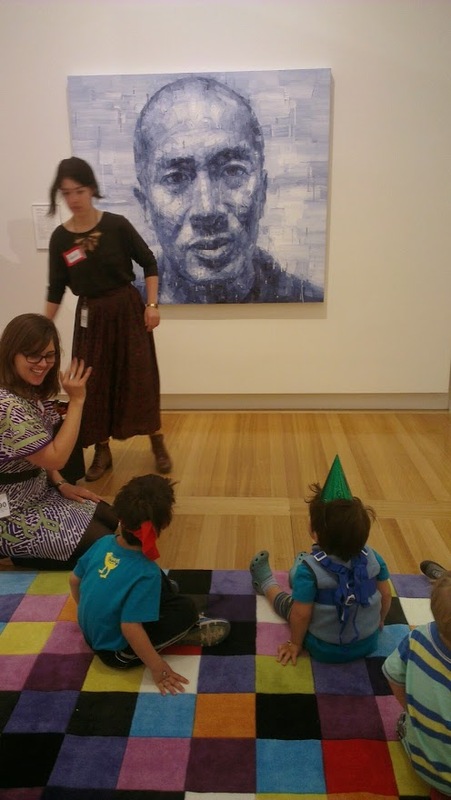 We were delighted, albeit somewhat intrigued, about being allocated a family fun visit to the National Portrait Gallery as part of VisitCanberra’s Human Brochure. 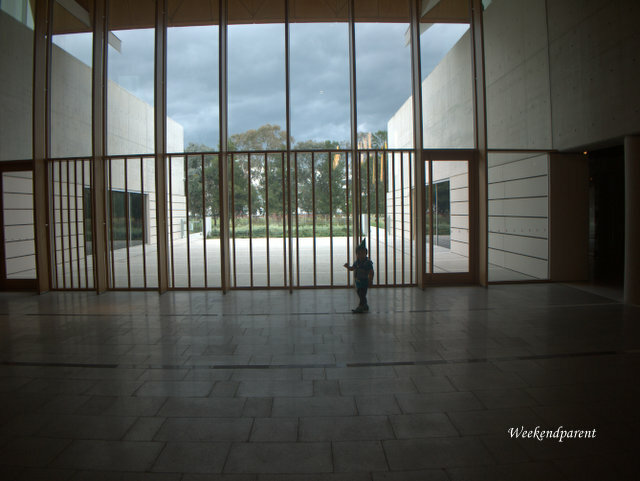 On a previous, child-less visit to Canberra, my sister, brother-in-law and I had stumbled into the National Portrait Gallery when it was then in the Old Parliament House. We were blown away. Actually, I was deeply touched by the collection of portraits about people — Australians mostly — who had made such a deep and profound impression on our nation. Call me patriotic, and I am. But a gallery and kids? Young, active boys who like to run, run, run? Little A on the run in the lobby of the National Portrait Gallery. He does not seem to have a stop button. We need not have worried. It was educational, a little crazy at times, but lots of fun. And we did not destroy any priceless artworks. 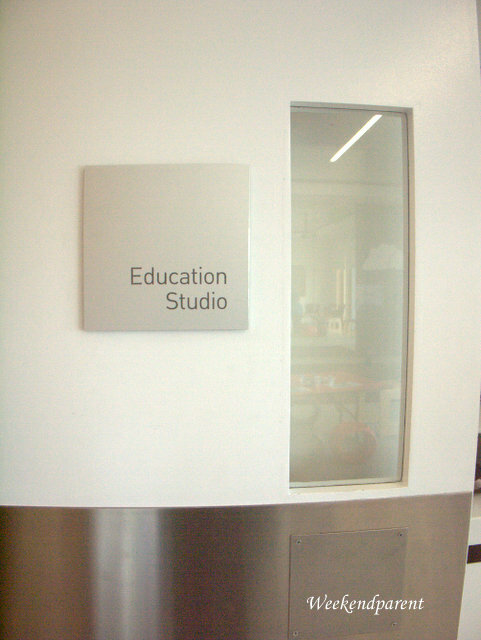 First destination: the education studio. Hidden away in a secret corner, is a purpose-built studio. I liked the fact that there was a full-length window along one wall, allowing us to look out to Questacon. Not my image of a stuffy gallery at all. 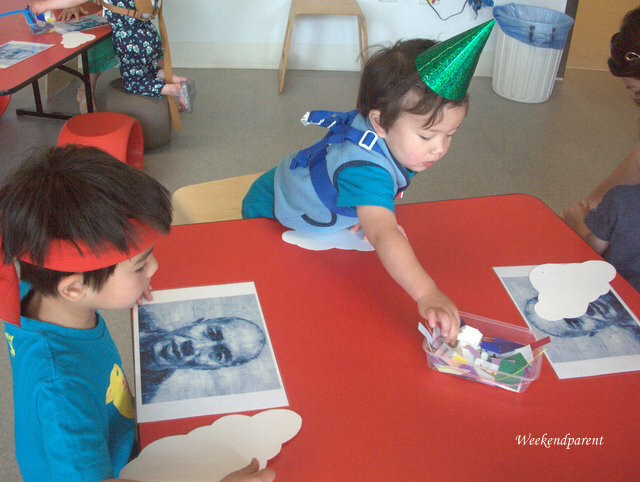 I wondered how the staff would find ways to educate the children about the portraits in the gallery. And manage to hold their interest. We started with rain. And colour. 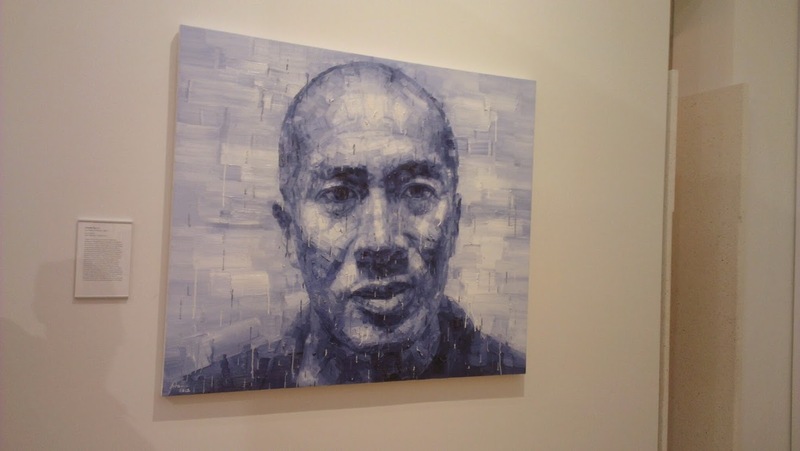 The theme was the portrait of Charles Teo, a renowned and eminent neurosurgeon painted by Adam Chang. This was not the sort of portrait I was expecting (historical stuff, maybe?). 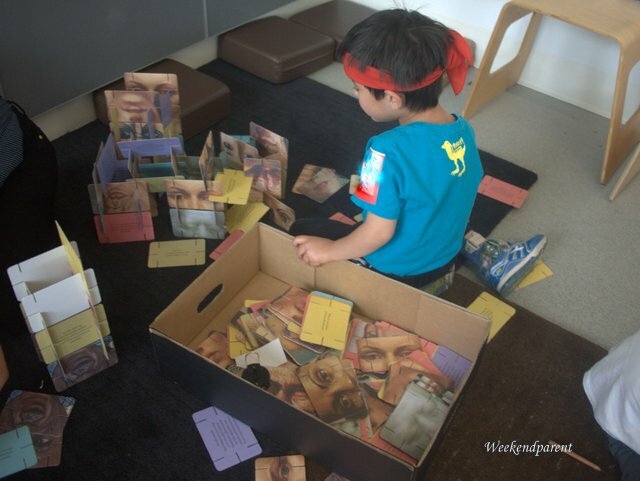 It was so visual: I felt it really jumped out at you, and it was something the kids could relate to. This was I think in part because of the size, and also because their own heritage is part Asian. There seems to be deep empathy in his eyes that I found myself drawn to. And the kids liked ‘Charlie’ as well. We talked about the colour blue, and rain. We sang ‘rain, rain, go away, Charlie Teo wants to play’. 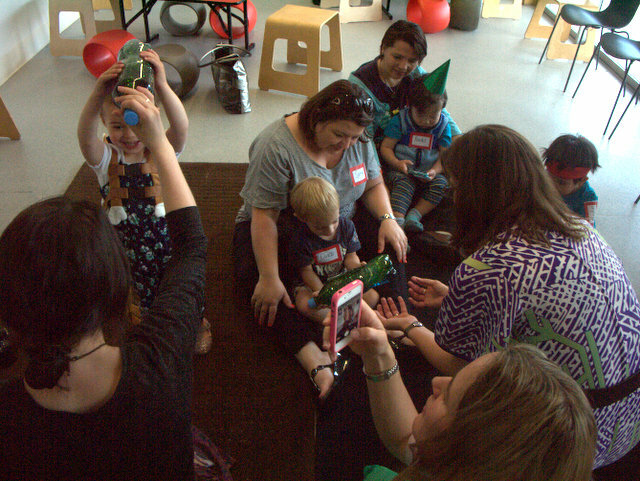 And then Grace, one of the educators, handed around a bottle filled with swirling paint and glitter. One of the younger kids wanted to take the lid off, but thankfully there were no accidents. Then we talked about the sun, and the colours yellow and red. On the opposite side of the room, there was a picture of a giant sun. 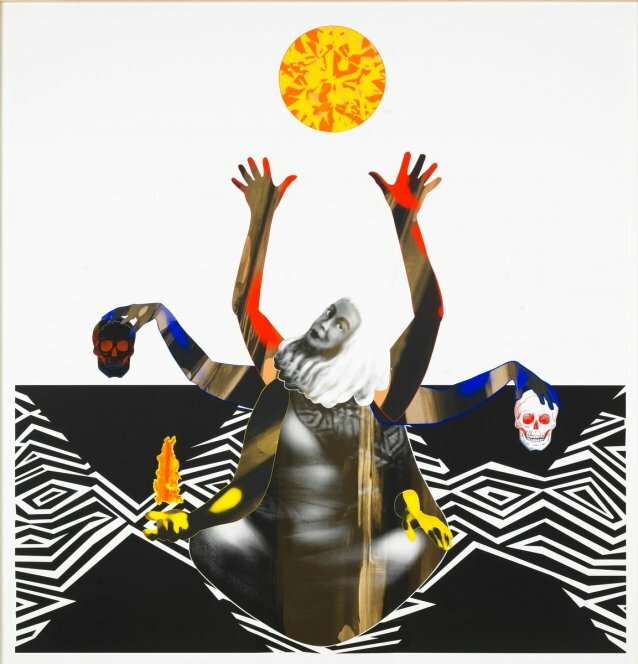 We later found out that this was featured in a non-conventional portrait of Professor of Indigenous Studies, Marcia Langton, by Brook Andrew. Now it was time to venture into the portrait gallery itself. “Would you like to go and say hello to Charlie?” Grace asked. The kids were excited. With instructions not to touch anything, she guided us through the gallery playing a game as to who could find Charlie. “There he is!” They had put a mat in front of the Charles Teo portrait, and all the kids sat down (well, most of them — some were still a bit active and some of the parents also wanted to gaze at the portraits on display). My kids sat themselves right at the front. They are good like that — I think they are trained at childcare to sit on the mat when someone is telling them a story. Grace pulled out a giant stick. I thought it first it must be something indigenous as it looked a bit like a didgeridoo, but it was in fact an Aztec-style rain stick. The kids had lots of fun taking turns to make rain. Even Little A. 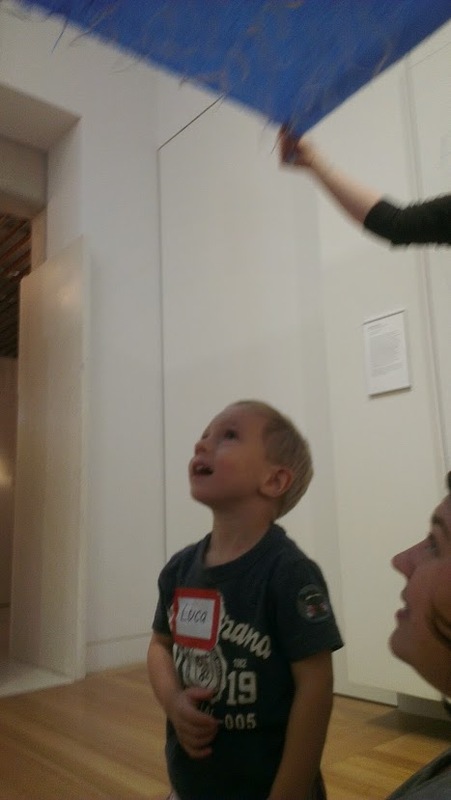 And my nephew was really into it. Then onto find the sun. 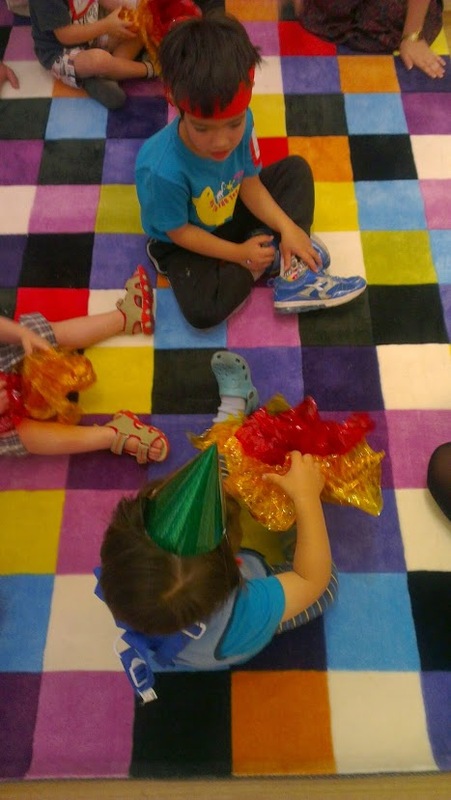 Once again there was a mat for the kids to play, um sit, on. 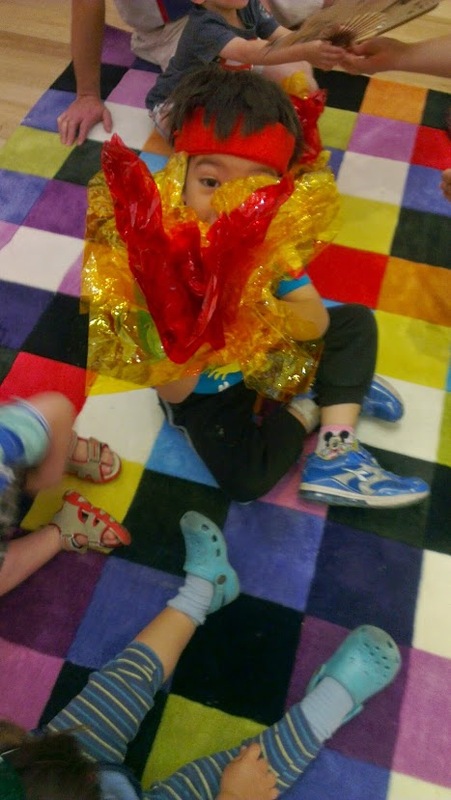 And this time they had cellophane suns to touch and explore. 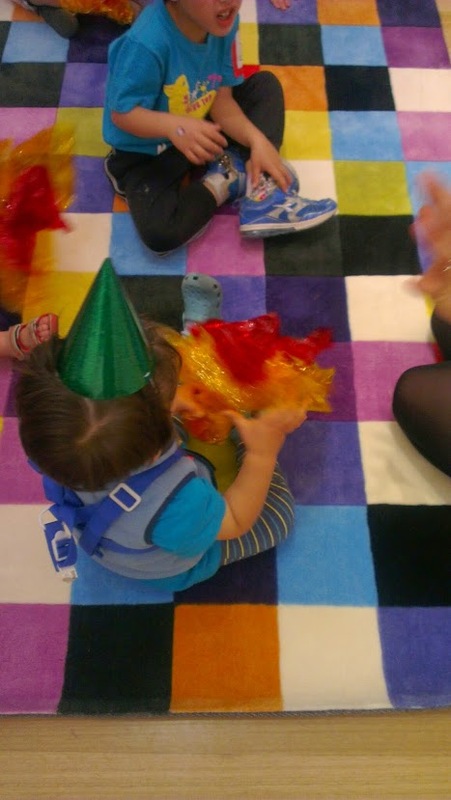 My boys loved the yellow and red colours, and also the crinkling sound the cellophane made when crunched. Thankfully I need not have worried about the potential for artistic damage, because it was now morning tea time. And as my Nana would have said, they put on a good spread. 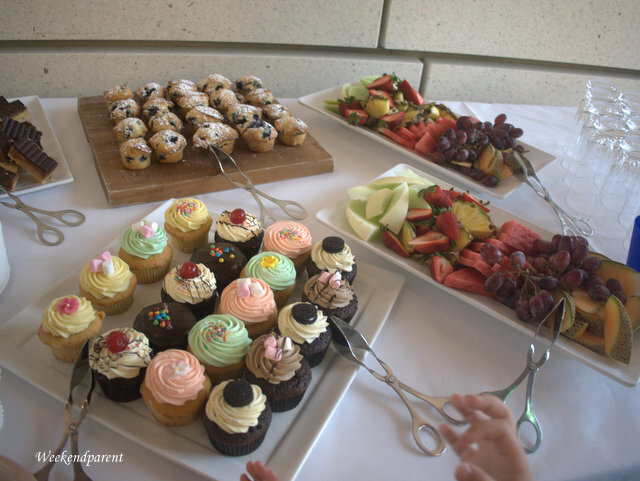 Did you notice the little hands reaching for the cupcakes? More than one child had to be restrained from gorging on cupcakes. Somehow the fruit was not quite as attractive. 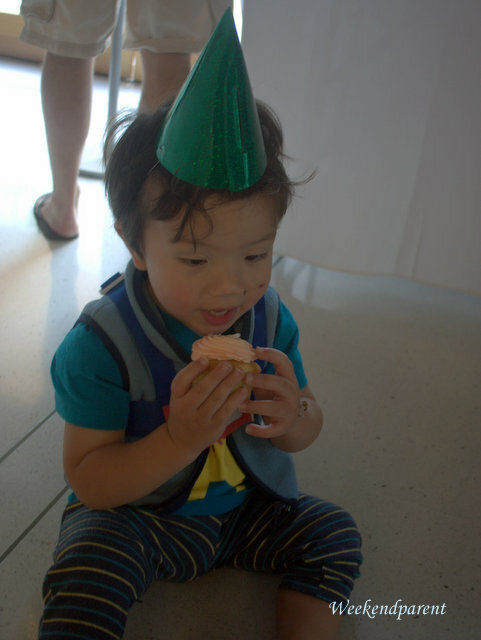 Unfortunately, what goes up must come down and the delight at sugar icing was soon followed by a spectacular tantrum. A lying on the floor screaming tantrum. My sister kindly took Little A outside and reasoned with him for a bit. And staff were very good about it; quite understanding really. They even smiled and laughed at Little A as he ran through the foyer shortly before the massive meltdown. 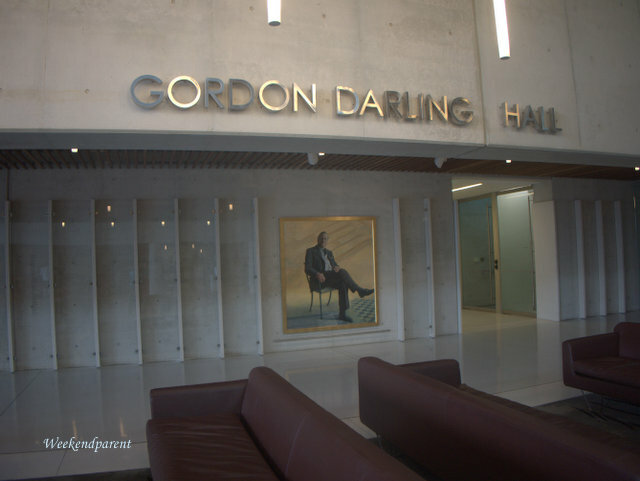 Speaking of the foyer, isn’t the Gordon Darling Hall magnificent? Gordon and Marilyn Darling were instrumental to the founding of the National Portrait Gallery. 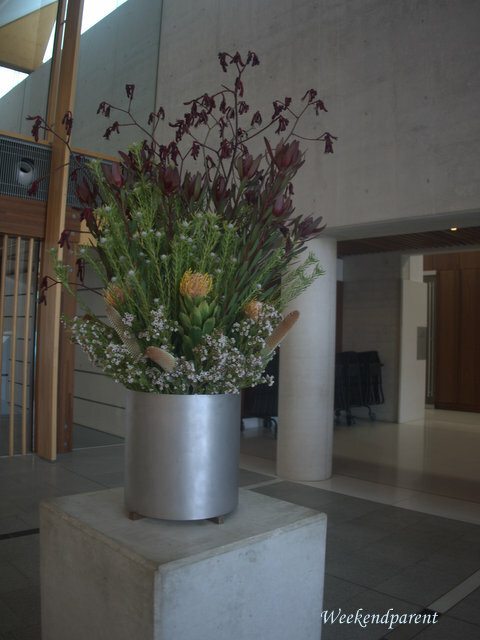 Marilyn still sends flowers every week, usually Australian natives, that grace the hall. 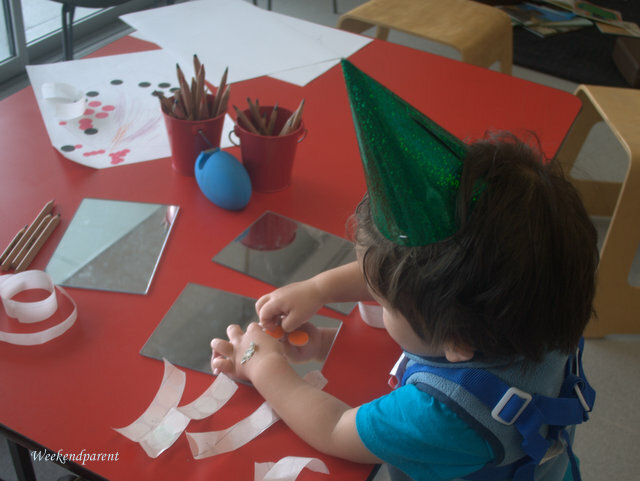 After morning tea, the kids stayed in the activity room doing sticker paintings and portrait puzzles, while some parents were treated to a highlights tour. My lovely friend Trish minded the kids for me. Little A was an absolute angel — right until I returned and he started grizzling again. Tamsen our guide started by giving us a tour of the modern portrait section. 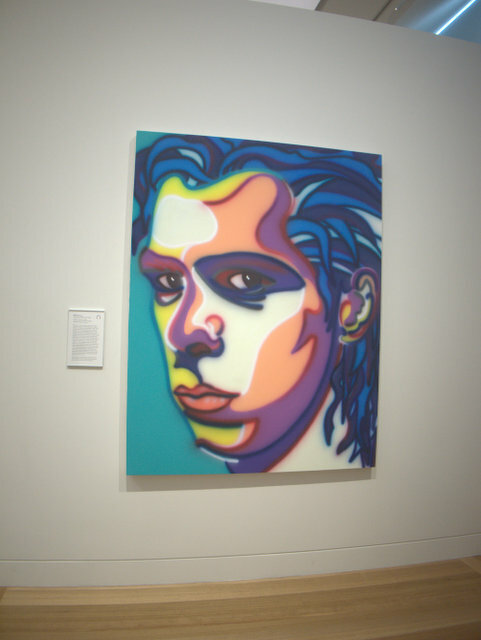 The gallery has plenty of traditional portraits, but also encourages unconventional pieces of unconventional people, such as this portrait of rock musician Nick Cave by graffiti artist Howard Arkley. And this iconic portrait, one of the most famous in the collection, of actress Debrorah Mailman. 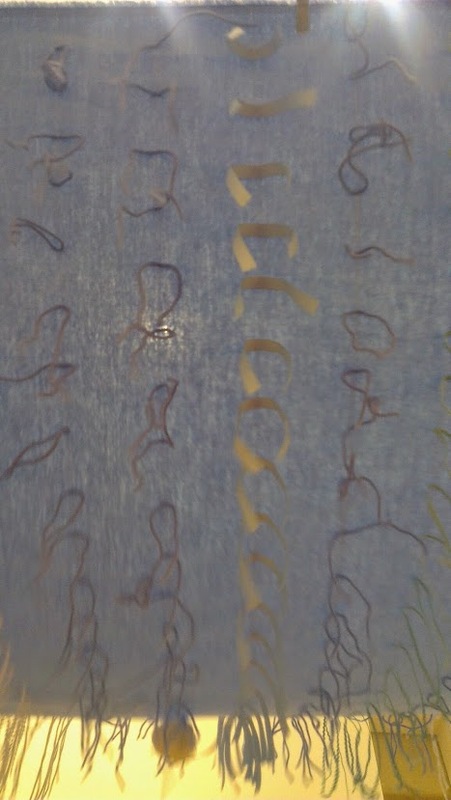 The oil painting, by Evert Poerg, is painted on wool bales. Look carefully and you can see the holes made by the hooks. 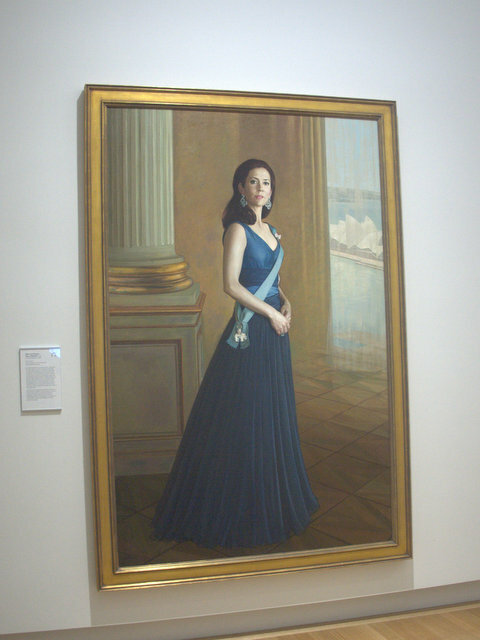 While not on the tour, I could not help but pause to reflect on the regal elegance of the portrait of HRH Crown Princess Mary of Denmark by Jiawei Shen. While I am not a royalist per se, I love the romance behind the story of how Mary and Fred met and married. Ah, true romance. Who didn’t watch, or at least read about, the royal wedding? Tamsen our guide drew our attention to a particularly interesting subject that we might otherwise have noticed: Ms Lola Montez painted by Friedrich Durck and Joseph K Stielder. Ms Montez was a notorious, adventurous, self-made woman. After eloping with a soldier to avoid a forced marriage, she was publically outed as an adultress. After divorce, she reinvented herself in Spain as a dancer. 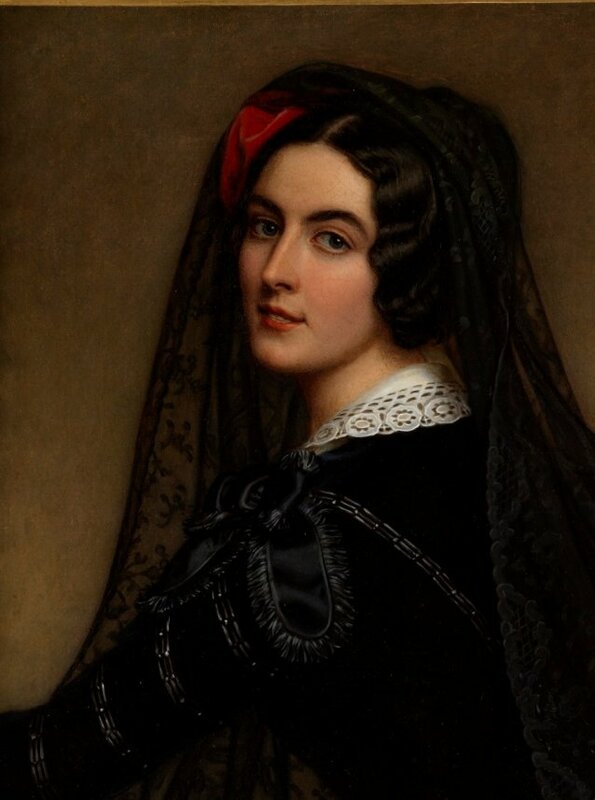 She had numerous lovers, including King Ludwig I of Bavaria who was forced to abdicate after it was revealed that she was not in fact Spanish but rather an Irish divorcee. She then travelled to America, and in the latter days of her waning career ventured onto the goldfields of Australia in search of opportunity. She was already infamous, but became even more so after she raunched up her performances by performing a ‘spider dance’ in a short gauze skirt. And a public horse whip match with a newspaper editor in a hotel foyer also attracted attention. Oh, you can just imagine those wild, anything-goes gold rush days. But even by those standards, she was a sensation. 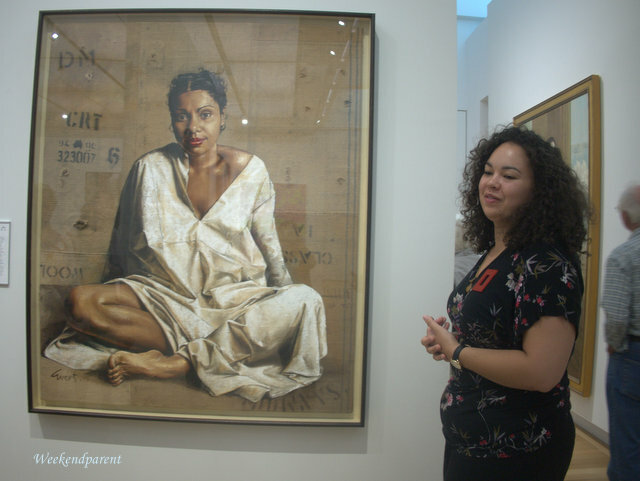 The National Portrait Gallery is one of those institutions that you simply must visit. 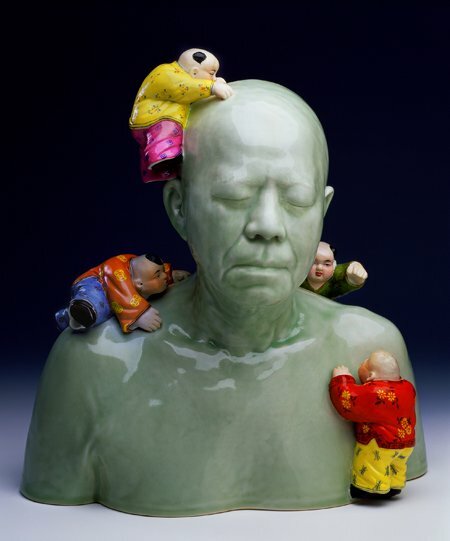 In fact, my dad and stepmother are venturing there tomorrow to see the latest exhibition ‘In the Flesh‘. 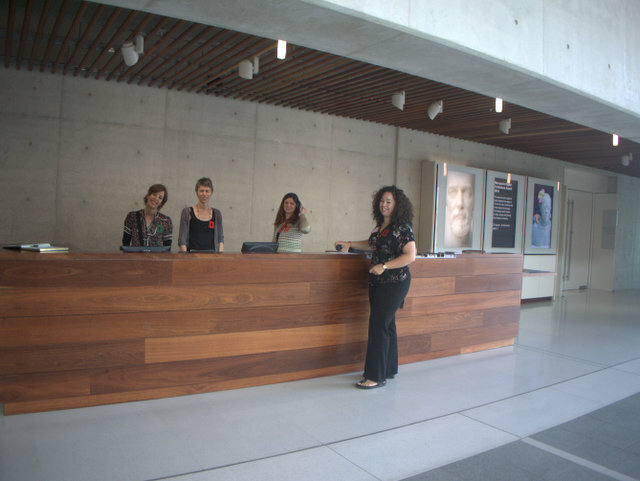 The National Portrait Gallery is open 10.00am to 5.00pm daily. Admission is free. 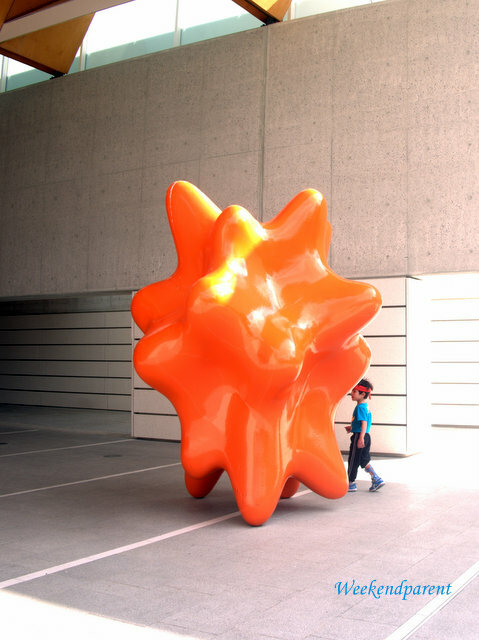 It is situated in the parliamentary triangle, in between the National Gallery of Australia and Questacon. Weekendparent visited the National Portrait Gallery as part of VisitCanberra’s 101 Local Humans aka Human Brochure campaign.